BIRMINGHAM, Ala. — Despite Perrin Buford’s career-high 29 points, Middle Tennessee (15-14, 8-8 C-USA) fell to Alabama-Birmingham (16-13, 12-4 C-USA) in triple overtime, 100-95. The Blazers controlled the majority of the first half on the back of freshman Chris Cokley’s eight points. The scoring was relatively even for the Blue Raiders. Junior Darnell Harris chipped in five, while fellow junior Perrin Buford and sophomore Reggie Upshaw notched four points apiece. UAB ended the first period on an 11-2 run to go up 37-25 at the half. MTSU made up for lost time in the second half. The Blue Raiders hit seven-consecutive shots midway through the second to cut the Blazer lead to five, with the score 51-46. Junior DJ Jones posted 13 second-half points. Buford added 15 more in the second half, including a game-tying layup with 1:06 left in regulation that would send the game into overtime. Both teams were knotted up at 69. The first overtime was a back-and-forth battle. MTSU battled back from five down to force a second OT, as Jacquez Rozier hit a game-tying layup with five seconds left on the clock, making the score 77-77. 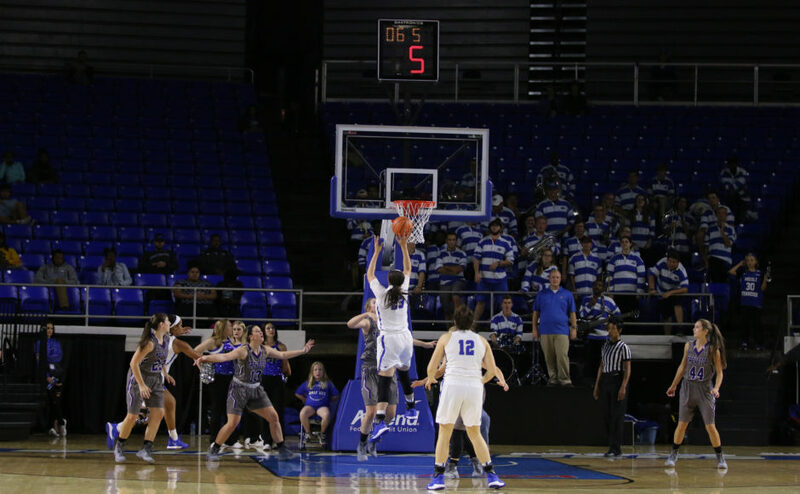 Buford owned the second overtime period, chipping in seven of the Blue Raiders nine points. UAB’s Hakeem Baxter hit another tying basket as time expired, sending the game into a third overtime, tied at 86. Middle Tennessee was unable to overcome the Blazers in the third OT. Jones hit two three-pointers, but they were not enough for the flurry of attacks from UAB. The Blazers ended the game on a 7-1 run to win, 100-95. Buford led the Blue Raiders with a career-best 29 points and nine rebounds off the bench. Jones also set a career-high in points. The combo guard poured in 24 points, including six three-pointers. Upshaw and Rozier also posted double figures, with 13 and 11 points, respectively. The Blazers had six players with double-digit points. Cokley led the way with 20 points off the bench. Robert Brown had 18. William Lee and Baxter had 16 points each. Nick Norton scored 12, while Denzell Watts had 11 of his own. UAB shot 53 percent from the floor, compared to the Blue Raiders’ 41. The Blazers also hit 26-of-31 free throws, good for 84 percent, while MT hit only 24-of-36. 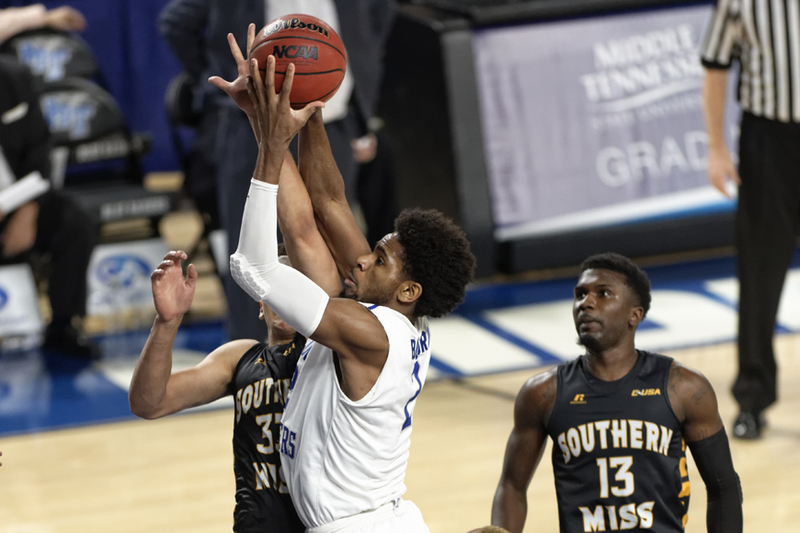 MTSU will look to get back on track in Miami, as they take on the FIU Golden Panthers Thursday at 7:30 p.m. CST at FIU Arena.